"The ancestor surnamed Bao-Xi had become the king of heaven and earth. (He) looked up to see the phenomenal (changes) of the heavens, looked down to observe the (natural) rules (i.e., patterns) of the earth, watched the (instinctive) behaviors of birds and animals and how they were situated with (i.e., related to) the earth. Near, (he) observed the (changes) of things around him and far, (he) observed the (repeating patterns of) objects, then (he) created the 'eight trigrams.' This was thus used to understand the virtue of the divine (i.e., natural spirit or natural rules) and also thus used to resemble (i.e., classify, pattern, or understand) the behaviors of millions of objects (i.e., lives)." From this, (we) can see that the creation of the 'eight trigrams' was based on the ceaselessly repeating cycles of great nature, following the instinctive behaviors of the million objects (i.e., lives) between heaven and earth. The quotation in this paragraph is from the "Great Biography" section of The Book of Changes. Bao-Xi (包羲) was the ancient ruler in China (2852–2737 B.C.). After he observed the cyclical patterns of nature and the instinctive behavior of animals, he created the "eight trigrams" (bagua, 八卦). From the eight trigrams, natural cyclical patterns can be classified, traced, and predicted. Since animals and humans are part of nature, the eight trigrams can also be used to interpret an event and predict its possible consequences in the future. (In) changes, there is taiji. This therefore, produces liangyi (i.e., two polarities), Liangyi generates sixiang (i.e., four phases), and sixiang bears bagua (i.e., eight trigrams). (From) bagua, good or bad luck can be defined (i.e., calculated or predicted). (From) good or bad luck, the great accomplishment can be achieved." It again said: "What is liangyi (i.e., two polarities)? (It is) one yin and one yang. Dao generates one, one produces two, two yields three, and three yields millions of objects." From this (we) can see that it is due to the natural rules of taiji, that wuji (i.e., no extremity) evolves into yin and yang two polarities. From yin and yang's generation two polarities, the four phases are generated, and subsequently, from yin and yang's generation of the four phases, the eight trigrams are formalized. From this (we) can figure out that "one yin and one yang is called Dao." This also means that the Book of Changes is the (book which describes) the consistent natural laws that apply to the universe and the human body. From interaction of yin and yang, millions of objects are generated. From the variations of yin and yang, millions of affairs are communicative (i.e., exchangeable). Therefore, Changes, Series Diction also said: "To close means kun and to open means qian, one closes and one opens means variations. To and fro exchange from each other ceaselessly means communicative (i.e., exchangeable)." What is kun? It is yin. What is qian? It is yang. Changes, "Series Diction" (易·系辭), was written by Zhou Wen Wang (周文王), the first ruler of the Zhou dynasty (周朝) (1122–255 B.C.). He wrote an interpretation for The Book of Changes. In his book, he clearly pointed out that because of the existence of taiji (太極) (i.e., grand ultimate), there are changes in the universe. Taiji is an invisible force or power which makes the wuji (無極) (i.e., no extremity) divide into two polarities (i.e., yin and yang) and also from two polarities return back to the wuji state. Moreover, due to the existence of the taiji, two polarities can again be divided into four phases and from four phases into eight trigrams. The explanation of this kind of natural derivation has also been found in Lao Zi's Dao De Jing (老子道德經). Dao De Jing (道德經) has also commonly been called "Lao Zi" (老子) in Chinese society. Lao Zi explained that due to the existence of Dao, one is created. In addition, one can create two, and then three, and so on, until millions of objects exist. From this, we can see that taiji is the same as Dao. That is why it is said: "What is taiji? It is the Dao" (何謂太極？道也). From yin and yang's mutual interaction and exchange, millions of objects can be differentiated. For example, the soil interacts with water and sunshine to produce growing plants. It is a study of the need of animals to consume other life in order to survive. Finally, animals die and return to the soil. All of these natural cycles are due to the natural exchanges and interaction of yin and yang. It means the insubstantial emptiness or an infinitesimal point of space, not big or small (i.e., no dimension), no yin or yang. Through taiji's pivotal action, yin and yang two polarities are divided. Thus, the yin-yang symbol is formalized. This symbol can then be again distinguished as yang yin-yang symbol and yin yin-yang symbol depending on how the four phases of yin and yang are demonstrated (e.g., four seasons) through cycling. For example, if we demonstrate it with our right hand, the clockwise direction of cycling is classified as yang symbol while the counterclockwise direction of cycling is classified as yin. However, if we demonstrate it with our left hand, then everything is reversed. This is simply because generally our right hand is classified as yang while left hand is classified as yin. Wuji (無極) is a state of emptiness or simply a single point in space. There is no discrimination and there are no polarities (or poles). According to Yi Jing (i.e., Book of Changes), originally the universe was in a wuji state. Later, due to the pivotal action of taiji, two polarities (liang yi, 兩儀) (i.e., yin and yang) were discriminated. However, we should understand that yin and yang are not definite (or absolute) but relative according to specifically defined rules. From these rules, four phases (si xiang, 四象) are again derived. From different perspectives, the yin-yang two polarities can again be divided into yin and yang. For example, if you use your right hand to follow the yin and yang pattern, the clockwise cycling belongs to yang while the counterclockwise cycling belongs to yin. Generally speaking, your right hand action is classified as yang and your left hand action is classified as yin. From this rule, the yin-yang cycling will be completely reversed if you use your left hand. These general rules are applied in taijiquan and also in other internal styles such as baguazhang. There are some specific rules that apply when you manifest the yin-yang polarities into two dimensions. However, we exist in a universe of at least three dimensions. Therefore, the concept of two polarities should be adapted to three dimensions so we can comprehend the natural Dao thoroughly. Once you add the third dimension to the yin and yang symbols, you can see that the energy patterns and derivation are spiral actions. When nature loses its balance, the energy manifests in spirals and millions of lives are influenced, or even created. These manifestations can be seen from galaxies in space, to tornados and other storms, to the formation of seashells, and even the tiny, twisted strands of our DNA. You can see that when yin-yang is manifested in two dimensions in taiji ball qigong, it is an action of coiling, and when it is acting in three dimensions, it is a spiraling maneuver. If you use your right hand to generate this spiral motion, then the clockwise and forward motion is classified as yang while the counterclockwise and backward motion is classified as yin. If you use your left hand, since the left is classified as yin, all directions are reversed. This is a method to practice the basic skills in taiji ball qigong for changing from insubstantial to substantial and back again. All action in taiji ball qigong originates from the real dan tian (a point, center of gravity), where the wuji is located. From this wuji center, through taiji (i.e., mind) the qi is led, Yin and yang spiraling actions are initiated, and taiji ball qigong movements are derived. 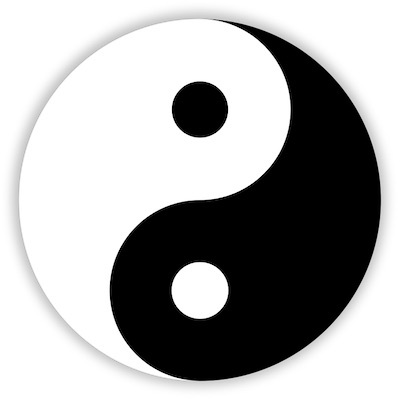 The creation of taiji ball qigong was based on the above philosophies of taiji and yin-yang. It is believed that from understanding the theory of taiji and yin-yang, we will be able to trace back the origin of our lives. Also, through this understanding, we will be able to train our bodies correctly, maintain the health and strength of our physical and mental bodies, and gain longevity. Since Daoists are monks, the final goal of their spiritual cultivation is to reunite with the natural spirit (tian ren he yi, 天人合一) (i.e., the state of wuji). In order to reach this goal, they must cultivate their human nature and nourish it (i.e., discipline their temperament). The above is an excerpt from Tai Chi Ball Qigong For Health and Martial Arts by Dr. Yang, Jwing-Ming and David Grantham.